Ownership / Access: Mongon Family. 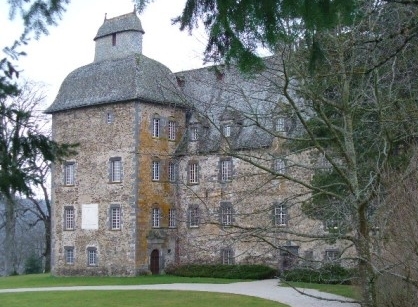 Notes: Château de Conros is a medieval castle located in Arpajon-sur-Cere in Cantal. The castle is the subject of a registration as a historic monument since September 30, 1991. Mentioned in 1230 as a super novo edificio, then as a repario in 1269 as castrum. Conros, or rather the ancient castle of Montal, was the seat of a viguerie Abbey whose family Astorg was the holder. It was also a place to monitor the Cabrières bridge on which she perceived a toll. Château de Conros belonged among other families of Auriac, Astorg, Saint-Martial and Humières.